As SA’s leading provider of roofing, ceilings and partitioning since 1931, Scheltema can be proud of their reputation for delivering superior workmanship and specialised expertise across the industrial, commercial, and residential roofing sectors. Scheltema believe that it is their ability to innovate, to push boundaries, to go beyond the parameters of their core service offering and orientation, that truly sets them apart. 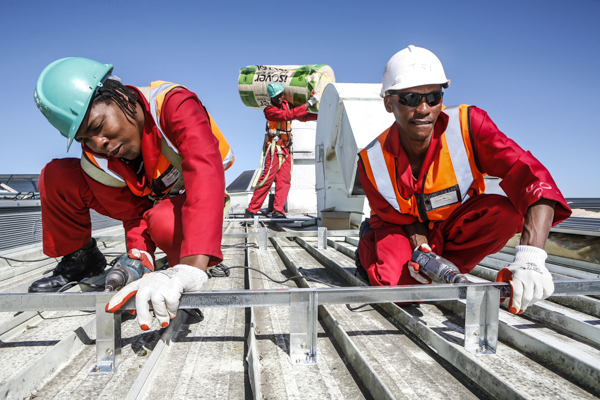 According to CEO, Michael van Breda, Scheltema has been honing and developing its ability to take on specialised roofing and re-roofing projects for several years now. These include timber frame construction, asbestos removal, re-roofing, eco-construction, heritage work, and large scale, technically demanding contracts, both locally and abroad. This enterprising spirit finds expression in two of Scheltema’s current projects. At this centre, Scheltema was commissioned to replace the entire 50 000m2 roof and skylights – with the added stipulation that the centre remain fully operational for the duration of the project. Scheltema designed and developed a bespoke spacer system or sub-grid which allows for the new roof to be laid on top of the old one, using a series of galvanised steel up-stands. Insulation is laid beneath the new skin in an uncompressed manner so that its thermal properties are maximised. “A great deal of research went into the development and refinement of this product, but the end result is a system that is economical, practical, thermally efficient, and relatively simple to install. It can be scaled for large and small re-roofing projects” said David Payne, Director of Scheltema’s Industrial Department. Scheltema’s work at L’Ormarins in Franschhoek demonstrates both an ability and a willingness to deliver creative, innovative, customised solutions to meet the needs and tastes of individual property owners. The L’Ormarins project commenced in 2006, and has slowly seen the replacement of all old roofs and the installation of new ones to a vast array of stables, homesteads etc., using a steel thatch-like product that has all the aesthetic appearance of thatch, but none of its disadvantages. Keen to retain the rural style and vernacular of the Cape winelands, the estate owners tasked the professional team with the sourcing of a roofing product that would allow them to preserve the aesthetic integrity of their estate while circumventing the necessity for ongoing and costly maintenance. On discovering that the local product was no longer being manufactured, Scheltema once again set about developing and manufacturing a prototype that would meet their client’s needs. This process resulted in the development of a customised thatch-like substrate made from corrugated metal sheeting that has the same appearance and variegated colour of thatch, but which requires no maintenance whatsoever. Being steel, it is also non-corrosive and non-combustible, further augmenting the product’s durability, cost efficiency and safety.